Last week, EU-China leaders met in Brussels for their annual summit. The tone for the meeting had been set by a series of EU policy statements, characterized by a hardening tone vis-à-vis China – a policy shift grown out of mounting European frustrations over China’s reluctance to deliver on commitments entered into in the past. European leaders were pleased over the joint summit statement, in which China acknowledged the need to address European concerns over its industrial policy, but the true victory for the EU lies in the timetable for some of the measures that China endorsed, as well as in the remarkable unity with which the member states acted. This unity allowed the EU negotiators to take a tough approach, even threatening to leave the talks on a summit statement if their Chinese counterparts were unwilling to make genuine headway on some of the longstanding irritants straining the Sino-European relationship: involuntary technology transfers, an industrial policy heavy on subsidies, and the lack of market access for European companies. This strategy worked, with China making last-minute concessions to secure a meaningful joint statement. In that statement, Beijing reaffirmed its support for the rules-based trading system and committed to discussing its industrial policy. Notably, the statement also included a reference to forced transfers of technology, in what can be seen as tacit Chinese acknowledgement of the prevalence of this issue in its domestic market. The statement hence provides a glimmer of hope to longstanding critics of China’s disappointingly slow and shallow economic reforms. These still relatively minor commitments should not be interpreted as a policy shift in Beijing. Premier Li Keqiang, in his press remarks following the summit, reiterated the conventional line that China’s reform and opening up process is unstoppable, and that Beijing would never demand foreign enterprises operating inside its market to hand over technologies. Nonetheless, these commitments still carry political significance in that they illustrate how Europe can, by putting the sheer size of its single market to use, and by abstaining from the confrontational course of action followed by the United States, successfully pressure China into new commitments. Europe is not the sole front on which China is facing growing pressure over its industrial and economic policies. The commitments that Brussels obtained from Beijing relate to concerns Europe shares with most of its trading partners, including the United States. China’s willingness to concede was hence partially due to global – and not just European – pressure. In the implementation of these and previous reform commitments, it is therefore imperative that the EU team up with the United States and likeminded partners where possible to ensure China keeps its promises. The EU and its member states should likewise employ multilateral fora such as the Asia-Europe Meeting (ASEM), or bilateral cooperation mechanisms such as the EU-China Connectivity Platform, to duplicate language agreed upon in the joint statement relating to transparency standards, public procurement, rules-based trade, and forced technology transfers. The inclusion of specific deadlines in the joint statement generates additional leverage for the EU. Both sides agreed that “decisive progress” on a “Comprehensive Investment Agreement” is required over the next eight months in order to sign the landmark treaty by 2020. There was also agreement to conclude negotiations on geographic indicators by the end of this year. This represents a clear victory for Brussels, as China had long been reluctant to sign up to a specific calendar. The biggest loser of the summit is ostensibly U.S. President Donald Trump, whose protectionist economic policy and imposition of import tariffs on Chinese goods has so far yielded fewer results than Europe’s approach. With the conclusion of U.S.-China negotiations to resolve the trade war having been delayed numerous times, Beijing has so far not committed to the necessary structural economic reforms Washington is hoping to see. Trump’s preoccupation for reducing the trade deficit has led China to spontaneously purchase additional semiconductors and soybeans in an effort to create goodwill in the White House. Europe has therefore acted on the fair assessment that genuine economic reforms will not happen because of American pressure alone. As such, the United States will be keeping a close eye on the follow-up to last week’s EU-China statement, in an effort to assess whether the new reform measures China agreed to may be invoked by Washington to strengthen its hand in the on-going trade negotiations. It is the unity with which the EU’s member states acted, assisted by recently adopted legislation on foreign investment screening and public procurement, that allowed this week’s summit to yield movement on some of Europe’s perennial priority dossiers in its relationship with China. 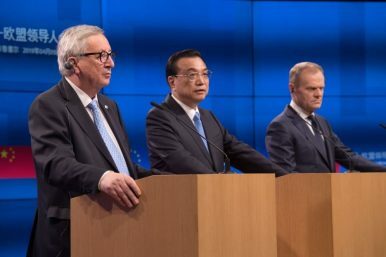 As discussions on the role of China in Europe’s democratic political system, including through the 16+1 (soon to be 17+1) platform, continue to rage, the EU demonstrated that ultimately its member states all benefit from an open, transparent, and fair Chinese economy that adheres to WTO rules and does not discriminate against foreign enterprises. It is this unity and solidarity that, in times of geopolitical uncertainty both far away from Europe and at home, must take center stage in guiding the continent in its foreign policy engagement with China. Bart Broer is a Research Fellow at the EU-Asia Centre, covering EU-China relations and connectivity. Previously, he was at the European External Action Service, working on Europe’s and China’s respective connectivity engagement in Asia.